Curtis Wright Model 1 (left) and Airstream Silver Cloud (right). Photos courtesy Dal Smilie. Somehow it seems fitting that, though the earliest-known factory-built Airstream featured entirely wooden construction, a full sheathing of aluminum nevertheless preserved it, ensuring a reunion of sorts with the earliest-known Curtis Wright trailer — another one of Wally Byam’s creations — this past summer. Though sleek flanks of highly polished aluminum riveted together in a breadloaf shape have become emblematic for the Airstream, Byam didn’t pioneer the construction method or even use it for his earliest travel trailers. Instead, after experimenting with travel trailers in the late Twenties — reportedly to continue seeing the world after he left the merchant marines for a career in advertising and publishing — he first offered Airstreams in about 1931 only as plans or as a kit that the customer had to source parts for, assemble, wire, and plumb themselves using primarily plywood and Masonite. While the first riveted-aluminum Airstreams — inspired by Hawley Bowlus’ boattailed 1934 Road Chief — appeared in 1936 with the Clipper, Byam had already moved from backyard builder to full-on travel trailer producer when he moved into a factory on Los Angeles’ West 22nd Street and followed up his DIY Torpedo Car Cruiser with the Silver Cloud. Like the kit-built Airstreams, the Silver Cloud relied on Masonite and plywood — and little else — for their structure and for their sheathing. During World War II, Byam figured that travel trailers weren’t necessary for the war effort, so he shuttered his factory and went to work for Lockheed and then Los Angeles’ Curtis Wright Industries (an altogether different company from Buffalo-based Curtiss-Wright Corporation), putting his aluminum expertise to work assembling aircraft. As the war came to a close, Byam reportedly had drawn up plans to start a camping store and catalog business, but Curtis Wright management — looking ahead to a postwar economy that didn’t need quite as many aircraft suppliers — approached Byam with plans to diversify into the travel trailer business. With aluminum in short supply, however, Byam had to revert to wooden construction for the first Curtis Wright-built trailers. Byam’s relationship with Curtis Wright didn’t last long, however: After a dispute over money, Byam left the company and restarted Airstream in 1947. One of those Curtis Wright trailers, a Model 1 with serial number 429, sold new to Ken and Elaine Hunter of Manhattan Beach, California. The Hunters enjoyed it for a good 15 years until they hit a bull outside of St. George, Utah, while returning from a camping trip to Minnesota. While the bull and the Hunter family emerged unscathed from the incident, the trailer suffered a bowed wall, a gash in the skin, a tweaked frame, and a severe maple syrup spill inside. Rather than scrap the trailer, the Hunters decided to simply remove the wheels and park it for the next 55 years. Though it had deteriorated over the decades, Oregon-based Dal Smilie recognized the trailer’s significance, bought it from the Hunter family, and turned it over to Chris and Trina Chapman to have it restored. “We tried to do it as original as possible down to the screws,” Smilie said. At about the same time, Chuck and Toni Miltenberger of Saugus, California, had started work on their 1936 Airstream Silver Cloud, serial number 199, which Chuck found in Van Nuys. While they didn’t get as much of the history of the Silver Cloud as Smilie did with the Model 1, they did discover a relatively intact trailer that retained all of its original wood and fixtures, thanks to a sheath of aluminum over the Masonite installed sometime during the 1950s. 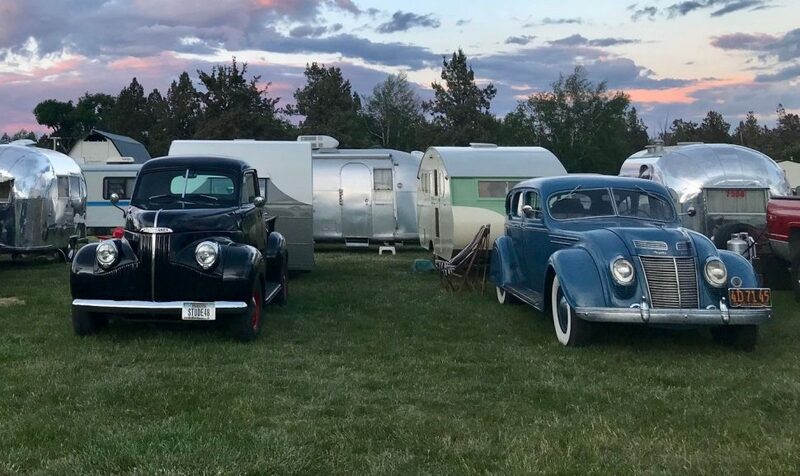 The restorations on both trailers wrapped within the last couple of years — the Silver Cloud’s in February 2017, and the Model 1’s a year later — and both trailers converged on this year’s Vintage Airstream Club 25th anniversary rally in Bend, Oregon, pulled by a 1937 Chrysler Airflow and a 1948 Studebaker M5 pickup, respectively. While both Smilie and the Miltenbergers acknowledge that examples of their trailers with lower serial numbers could exist, theirs are the lowest-known serial numbers and thus the earliest-known examples of their trailers. For more information on the Vintage Airstream Club, visit VintageAirstreamClub.com.